Confessions of a Ribbon Addict: A Breath of Fresh Air - New Card Kit Available Now! A Breath of Fresh Air - New Card Kit Available Now! My card today features the components of the card kit, along with a few old faves like Stitched Rectangle Frames, Stitched Mountain Range, Snow Drifts, Puffy Clouds, and Blueprints 27. All the elements are watercolored. I used the wood sheet that comes in the kit to create the frame around the scene. Be sure to head back over to the MFT Blog to see what the rest of the team has come up with using the Warm & Fuzzy Friends Card Kit! This is an adorable card! It looks like it was meant to go on a wall! Love the framing! How cute and colorful. I like the wood frame. Such a cute card with that moose. What a cute scene! I like the unique sentiment and the wood frame really adds to the outdoorsy theme. This is fabulous, great job!! The watercolour is vibrant and a great mixture of Die-namics. A lot of fun. Thank you. Love the mountain scene...cute card. What a fun little scene! Your mountains look super behind your sweet moose! Your sweet little scene looks terrific in that wood frame! 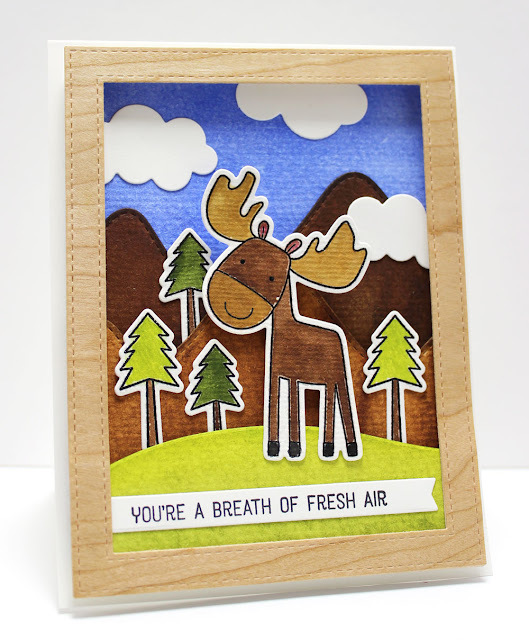 Your moose looks so happy in his woodsy mountains. Cute card. Love the mountains looming in the background. Great card! Love all the layers and the frame. This moose is so cute I really like the wood paper. What an adorable scene! Love the frame. Wonderful card! Love the frame! This is an amazing card! I love all the depth and coloring!